Letters to God, an inspiring faith based film, opens in theaters April 9, 2010. The story is extremely touching, inspired by a true story, and the hope beyond the movie is unstoppable. The message is about hope and trusting God, no matter the circumstances. The production is high-quality with an outstanding cast and crew. It is produced by David Nixon (Facing the Giants, Fireproof) and written by Patrick Doughtie, the actual Tyler’s father. Letters to God is the heartwarming story of a young boy’s battle with cancer and how he touches the lives of those around him.Tyler Doherty (Tanner Maguire) is an 8 year old boy diagnosed with a rare brain cancer.He writes letters to God asking Him to help those around him deal with his cancer.He explains that his letters are like texting your best friend. Tyler sees the stress his mom, Maddie (Robyn Lively) is under trying to run the family after his father passes away.He unselfishly asks God to help his mom laugh again.He is concerned about what his family and friends will do after he is gone.Not once does he complain or question why he has cancer.The postman Brady McDaniels (Jeffrey Johnson), going through his own battles with alcohol abuse and a bitter divorce, receives the letters.He is confused with what to do with the letters at first, but finds himself on a mission for God. 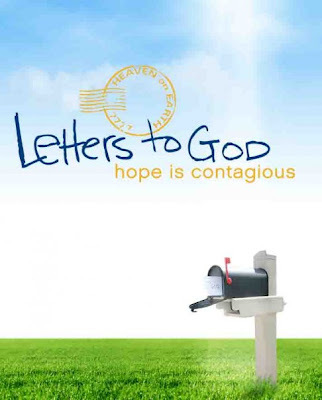 Letters to God is more than just a movie; it is a movement of hope. The official website, www.letterstogodthemovie.com, offers a multitude of information and encouragement. There you can watch the movie’s trailer, find theaters showing the film, preorder the soundtrack, find resources about cancer, and write your own letter to God. Letters to God is a powerful film of how one boy moves those around him to look to God for answers. It is very well done with an experienced cast and crew. Although the film tackles the issue of a young boy with cancer, the message is of hope. God can use any situation to bring people into a relationship with Him, even a young boy’s letter. See the movie, visit the website, and join the movement of hope!